Have You Seen This Man? LBPD Says He's A Suspect In August 14th ELB Murder, 15th St. just west of Redondo Ave.
(August 21, 2002) -- Have you seen this man? LBPD says he is a suspect in last week's murder of a 21 year old LB resident in the 3200 block of E. 15 St. (roughly one block west of Redondo Ave.) in the 4th Council district. 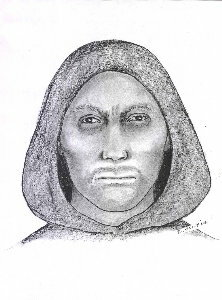 Police today released the composite sketch to the right and asked for the public's help in identifying him. say the man to right is a suspect in a brutal, ELB murder. On August 14 at roughly 10:27 p.m., LBPD and LBFD responded to the area in the vicinity of 15th St. and Coronado Ave. and found 21 year old Frederick Gonzalez of LB in his vehicle with a gunshot wound to his head. Mr. Gonzales was taken to a local hospital and pronounced dead less than a half hour later. LBPD says its preliminary investigation has concluded that mr. Gonzalez and another person wereleaving a friend's house and were driving away in Gonzalez's car when a male Hispanic, 18-25 years old, 5'6"-5'9" tall and thin approached the vehicle on foot and fired one shot at Gonzalez through the rolled-down, driver's side front window. The suspect fled on foot. The motive for the shooting is not known. Police today released the above composite sketch of the suspect. Anyone with information regarding his identity is urged to call LBPD Homicide Detectives Richard Conant or Robert Erickson at (562) 570-7244. Police say callers can remain anonymous.